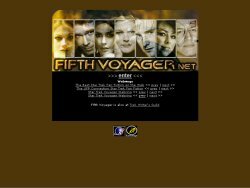 Fifth Voyager has changed layouts so many times, there are ones even I've forgotten about. A lot of the site's original layouts have been lost in many computer disasters but 99% of them still exist in screenshot form. So for the curious people, here are those screenshots to laugh at, or even to be afraid of. Before Aggressions was any bigger than two pages of script in a notebook (yes, script) and before I purchased Web Express and used Microsoft Publisher 97 to create websites, there was the FV Magazine. I'm not sure when it happened but the Magazine was dumped for the actual official site which was released with Aggressions Part 1 on Monday, the 4th December 2000. The version you see here never got online. It was terrible so that's not a bad thing. You had to see every page on the site as it's navigation was "previous" and "next", it had the contents page but I don't remember if it had links there. The second thumbnail above is supposed to be an information page, I'm the creator and I'm still clueless as to why the pics of the cast is there (and why one image isn't working). The first screenshot above shows the top of the cast page. Second one is the theme animation that was made. Above is thumbnails that listed and talked about Season One and Two episodes. As I don't have the actual site available, just the thumbnails I can only tell you what I remember. Season One was more or less unchanged episode listing wise, the episode "Survival Instinct" from Season Six was in there but was replaced by "Prepare For Trouble". Season Two was mostly the same at the beginning, after F9 Control Failure it was very different to the one that exists now. Luckily if I remember right the thumbnail above just had info about the first few only anyway, except it obviously had "Memories" there instead of "Saturday Night". I remember "Disconnected" being more sci-fy than horror/fantasy, and "Resistance" being about Janeway & Chakotay rather than James & Jessie, who didn't exist in FV yet. It just isn't a magazine without an interview, and the one above was a fake interview with Morgan, Emma and Lilly, hence the crap title on the second thumbnail. The first one was completely irrelevant as it was spoilers... for the original Voyager series. This version was very similar to the below version, just not in frames. 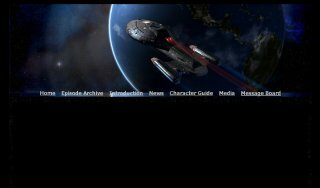 This layout was inspired by the official Star Trek site (or nicked ^_^), and I remember saving their index file so I could look at it on my computer. I remember that I changed to frames so I didn't have to update every file that had the menu on when I added a new button to the menu. I'm not sure where all my old intro animations all are, but the pic on the intro page above is one of the early ones. Also again you can see the old FV logo was made with regular fonts. The main page in the frameset above isn't the main page. The only version of this site I had, had a link leading to the new location on the homepage (same with the next version) and that was mainly it. The page I used for the screenshot above is actually the episode index. If you can see it clearly, you'll notice there are four columns, one for each season. I had Seasons 1 - 8 more or less planned out, which I found out was very pre-mature. Seasons 2 and 3 themselves are completely different to the ones in that episode index, well except the beginning of 2. Season 1 is the same. The 2014 version is a tribute in a way to this, if you're looking at this page while it's in use you should see what I mean. Once again the menu system stayed the same in this version. Also I had made the FV logo that is used today to put on the intro page, and in the main page in the frameset (obviously to show it off a little ^_^). I remember this version very well. I wanted to change the site considerably so you wouldn't recognise it. The menu was on the bottom frame, with new images for the menu. There was a marquee at the top of the page, and everything else was in the middle frame. I still don't know why it isn't on my computer. I know I started working on it on my mam's computer, and the files were on there. I'm sure I must have done updates on my own computer, so I'm definitely stumped on this one. 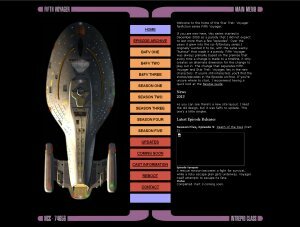 2002 marked the demise of the Star Trek.com inspired menus, and introduced good old written links. Not just that, this version also introduced a different background image and lots of OTT Paint Shop Pro lighting effects. I should have known one day that I'd become to regret doing those. The thing I liked the most about that version was the episode index, and how it loaded the newest episode when you went into it. This version was a big step for me. I had become so used to using frames that it proved very difficult to do this version. I had to change the site so there were no frames since Angelfire didn't support frames very well. 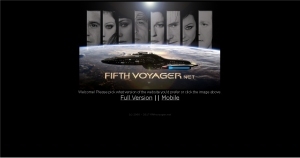 This version was never going to be made when I first released Fifth Voyager 2002. The original plan was to have three versions during the year. This version was the result of boredom, all I wanted to do was to change the background image but I ended up changing a lot more than that. Of course all the images that were used on the main page slowed the site down considerably. The previous two versions was so very alike I decided to change the layout for this one so it looked a lot more neat. It worked but like every website, there was problems. The menu was only available on the main page, and going back was a bit slow since the site's host was a little slow on some computers (personally I didn't have any bother). Also for 1024 by 768 users the main page was a little bare. Despite all the problems, this version introduced a lot more features, big and small. This layout was very cramped on smaller monitors, which is basically one of two problems. The second problem was the amount of fiddly things I had to do every week. This version was one of the versions that took the longest amount of time to get the finished product. The one that took the longest was the very first of course. This version originally was going to keep the non-frame look but like older versions I wanted users to be able to use the menu nearly everywhere they go. Also I had to introduce the whole 'select which resolution you're currently using' thing, no matter what I did I couldn't get the frame set to work in both resolutions. Since the above version was too cramped for some visitors I re-designed the site a little to give the main frame more room. I also tried to reduce the picture sizes to reduce loading times. I noticed a while back that the splash page took too long to load. Ah dialup, nobody misses you. This version I totally screwed up thanks to an idea I came up with to reduce loading time. I started again on the next design. Damn I wish I had made a screenshot of it ^_^ The folder for this version was a victim of war between my computer and my mam & I. For some reason it didn't move to my backup drive like the rest of my websites did, so it was deleted during the format. Started off well, but it ended up looking too much like the last version. Work was restarted again. As you can see there's some screenshots of this one... The site was going to open up in a new little window. That's all I can say now. My old big bulky monitor was a lot darker than my current LCD one, yikes. This version isn't much different to the one below, menus are in different places and it looks like I was going to put more images into it. 2002 Version 4.0 was the first version that had a seasonal colour. Like that version this version had gone Autumn Red. The menu and the Episode Archive had changed dramatically to make updating easier for me, and everything easier to find. Nothing much to tell really, this was a temporary layout that was barely around. It was only introduced to replace the 'close site for a week while I finish off FV 2004' idea. It did however inspire me to stop working on the original FV 2004 layout and work on another, another, and then another lol. The top banner was used for the forum that was hosted elsewhere, when the forum started fresh here it got a different look. It's a shame, I still like the banner. The original FV 2004 design. It took me ages to make the main frame, it doesn't look much in the screenshot but believe me it was complicated. I loved this design until I started working on the forum's second design, the amount of purple in the forum made me look at the site and I felt it had the same problem. Several people suggested breaking up the purple with whites, blacks and more importantly blues, the second design was started not long afterwards. After researching lots and lots of other websites to get inspiration, I finally came up with a new design. For a few days I was impressed, but in the end it just looked common as muck and I felt it wasn't going to last a few weeks let along most of the year. Work started again. The intro page for the current design was very similar to this one, and the previous one may I point out (that's why there's no screenshot of it). My point is that there was a lcars system in the intro and when you went into the site you would find a run of the mill site (the one above). This one was created to include button menus, plus written menus also. 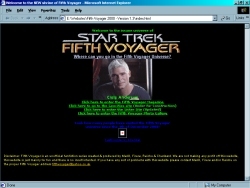 The main page was taken from the original FV 2004 design, and of course the top banner from the previous one stayed in. For a day I was impressed, but like before I wasn't happy with it, so yes I started again. The pictures don't really do the this version justice, trust me. 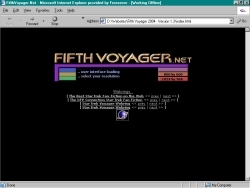 The splash page is the one Version 1.3 was using for a short while. 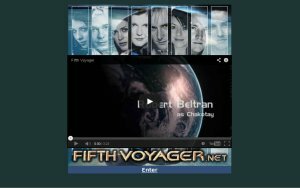 The forum was changed to match the site, the top banner was exactly the same but the menu was replaced with a blue box with "forums" and a few characters pics. This one was just the basic layout idea for 2005 Version 1. I wasn't entirely sure about this one. I liked it, but it didn't seem like a style that'll suit FV. All I did was the layout, I hadn't even gotten around to finishing the top banner. Another favourite of mine, the site usually turns out pretty sweet looking when it's using the red scheme ^_^ It had a basic design: the top banner, a small menu that would change if you clicked "Information" for example, then the main home frame. The home page had a 3Dy box effect which I loved and tried to re-create on future versions. The top banner was cool too, there's not many that I still like - I get sick/tired of them quickly, and I usually spot mistakes that annoy me. Not this one. Simple/plain splash page, simple/plain box frame style site. It worked I suppose, but it just wasn't good enough to last the six months, it did but I was glad to move on. Just for three days the site closed to allow me to upload files, delete unneeded ones without anyone noticing, and test the new ones. Simple, but it's not meant to be more than a ten minute job is it ^_^ The FV logo was resized to be bigger for once, it's usually made smaller in graphics, and I was expecting a big stretched glitchy mess but it didn't look too bad at all. That thing is indestructible and constantly reusable lol, not bad for an image I made in 2001. There must have been some reason why this wasn't chosen to be released. I found it again just recently and adored it. Apart from the banner it was a bit, simple... er than usual. The banner is nice, but you can see even in the tiny screenshot that the background that was supposed to mix the banner with the rest of the menu kept repeating itself badly, it doesn't look too great like that. Plus the design I guess looked very empty in widescreen resolution, it looks like that in 1024 by 768 so there you go, that's probably the reason. The only splash of colour on this little framed wonder was the good old FV logo and the links. I couldn't decide on a colour scheme, so black/white/grey took over. The design itself isn't half bad, it just had too many frames and scrollbars in it. Also the splash page was removed to hopefully keep visitors from leaving right away without seeing anything. The new site design was a part of a surprise gift for all of my patient readers, FV had been pretty lacking in the episode department for years and I wanted to do something special. I've tried to do marathons in the past, but this one more or less worked and it came wrapped in this pretty red package as well. This design helped FV break a tradition that's been around forever, a new design always appeared on the 4th December, the site's birthday, but I was still loving the current design and I didn't want to change it. Obviously it had to go sometime as I was finding problems with it. A new forum template was going to be made to match this on the site's birthday instead, but as the forum itself was being fixed around about that time, and I was working night shifts I didn't have the time to do it. Until the huge writers block from 2007 to 2011 this site design was around the longest. Once again the red designs are usually the best, I should remember that. As I had 2006 2.0 to beat, it was very difficult to create a better or just as good design. The first attempt was this. I loved it, but it had the same problem as the last: the menu would have to be added to almost every page, making updating the menu annoying to do. Afterwards I tried many framed versions of it, none of them got far at all, I always ended up back at this one. After a few more tries I came up with 1.2, which I loved for a while but amazingly despite me saying that it would be this one I'd get sick of quickly, it was that one it happened to. Before then I had posted a poll on the forums so viewers could pick between this and 1.2, only one voted for this, others voted for both or neither. People I talked to preferred 1.2 just cos of the colour scheme, because it was framed or the banner used on it. I dumped it only because I was never fully happy with the banner. Changing the menu that was apart of it would require even more work, the logo looked badly placed on it, the bordered tables were a faff to do on every page... you get the idea. In the end I decided to re-do this design with the lucky colour scheme (red) and a fixed menu which could be changed easily. This was the best attempt at making the site full screened and framed. The idea was to have a repeating image at the top, with the main banner in the centre of it... in any resolution it would look like the banner was the same size as the window. I couldn't make a decent enough background image for the banner that went with the design, so it was scrapped. Like I said above, I went back to 1.0 before restarting once again from scratch. I toyed with the resizing images/frames with resolutions idea for the current 2014 version, it's a little more subtle though. For a while I was in love with this design, then one day I looked at it, and felt 1.0 was miles better. Screencapping all the designs for this page made it official, it looks awful in screenshot form. It's too blue, plus the blue in the main page doesn't work with the banner/background image. I never liked the placing of the FV logo, and the image mapped menu would have made it difficult to update the menu, I would have to redo the banner to do it. I finally decided to return to 1.0, and redesign it once again. Starting afresh never seemed to work out. This time I decided to change the background color, the blue one annoyed me now, also the colour scheme. Red's always been a lucky colour with FV site designs (funnily enough 2004 did fine with blue ones but never mind, all other red ones worked out well). The banner had been made a while ago, it didn't fit as well with the new colours, so was recoloured itself. The menu was fixed so that it was a separate file, making updating it very easy. Other minor changes were the go to the top link at the bottom of each page (since it's not framed, getting to the menu on long pages like this one is annoying), centering almost everything, somebody commented that the 1.2 design was better because of that so... I did and it did look better. Also the headers were formatted like the menu, which is fiddly.. so I didn't bother with that this time. Since I did like what I did with the news and guides section with the frames with 1.0, I brought them into this version too. Inside the 2009 version of the site I had information on this and the other 2008 version. However there were no images for it. The next version I had available on my computer and the laptop was the 2011 one, which had no page like this. It looks like the screenshots were other vicitims of my home computer crash of 2012. Information from 2009 Version 1: The home frame just looked awful no matter what I did, I was worried about the purple border image repeating itself on the right on wider resolutions, and the menu was just crappy. So yeah this didn't last very long once it was finished, I just print screened it for this section and started on a new one. Like above, screenshots for this version are lost. The only thing I have left is the splash image I think is from this design. I can't find the design it belongs to and I know it was part of a released design (it wasn't new in the 2013 one). Information from 2009 Version 1: I've been wanting to do a full screen design for this site for ages, but always failed. You want to know why? See 2006 Version 1.0. You just have to make the right banner, which will go with a background image so it'll look right in every resolution. That version was the only one that came close, and it's so awful in any resolution that's in its 1000's. Never mind, there's always next year. For 2008's I had already made a banner that I liked, so I just began a simple, inline frame home page design like the black/grey design a while ago. Only this time that is the only frame, with the exception of the episode archive which stays the same. After messing around with the banner I had already made, to see if I could come up with a colour/theme for it to make it look different to past designs, I did come up with something. The menu is the big change, and when I say big I mean it in two ways. It's a big menu, there's a reason for that.. it's what makes the design look even better. The only problem with this design is that while trying to think up a design for 2008, I grew tired of trying to accomodate to 800 by 600, while still trying to make it look great in 1024 by 768. I was lucky however, when I tested it just to see how bad it looked in 800, only the home page frame's scroll bar is out of view.. the rest of it fits. It does look very cramped, but a site that doesn't look cramped in that resolution is going to seem empty in any resolution bigger than that. Nothing much to say really. I really loved the previous version, and after suffering from months of writers block I was left with a very close deadline. Naturally a simple redesign of it updated the site's look for 2009, leaving me more time to write (A/N in 2013 hindsight: lol). The changes include: swapping the menu and home frame so the menu boxes in the site's content, new colour scheme, new images, and a few new pages. Simple but enough. Looking back at it in 2013, this site design definitely ranks as one of my favourites. My only complaint is the excessive menu, though it was a nice looking gigantic menu. Like the one below, the last update for it that I got backed up from my broken computer, was not long after it was released. This version was updated a little, I remember that much. I imagine as I can't find it at all on my laptop, this design died along with my broken computer. Somehow it also took my 2008 screenshots with it, but none of the others. Naturally there's no folder for Version 1, I assume it existed at some point so I'll keep this one's name regardless. I really liked this version, but only for its banner/menu design. However it just brings back pretty awful memories of the writers block. This version was the big come back that the 2013 version ended up being, but it all went horribly wrong. It wouldn't be so bad if it wasn't for the fact that I couldn't even bring myself to update the site after 6th December 2010, so it was like that, advertising new episodes that never came for at least a year. I remember putting a very basic temp design in its place, just to get rid of the depressing thing until the real comeback came along. I have no idea where that is. Anyway these last two represent a sad chapter for me really. Only labelled as Fifth Voyager 2012 on my computer, this version was already the final design for many months. It was 2011, Aggression was completed, some episodes were edited. I thought I was more than ready to bring the site back for its birthday. It was just a simple design, and I was more than happy to keep it that way. When I got it into my head that I wanted to comeback with more than just Aggressions and an updated Half of the Heart, I moved the comeback to 2012. It was only in those later months I thought about making a more flashy look. I ended up scrapping it, later leaving a blind panic for a half decent design on the 4th. What ended up online was very similar to this. Instead of using lcars I thought about using Voyager itself in the design. Basically sections of the ships could be clicked and would lead to other pages. I didn't get very far, at all. 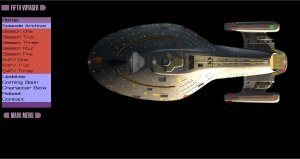 Don't ask for a screenshot, just google USS Voyager and you'll get the jist of how far I got. Does it look familiar? If yes then you were aquainted with the 2013 design. The banner was a lot larger here and a different colour. I was trying to get a nice reddish design, as my luck with them was pretty good. It failed me this time as I couldn't get the look I wanted. My laptop had a more up to date version with a bigger menu, also including a home page. The home page had some date codes I couldn't get to fit in properly. Also I couldn't get it to work as Date/Month/Year as I didn't know how to get th/st after the date. I think it was dumped when I moved onto the final design. This banner appeared in a lot more versions that never got finalised, I was determined to use it which hampered a lot of my ideas for designs. After this version I remembered that I had the year number wrong in the names. I was working on these early 2012 and I was out of practice, so mistakes like this will happen. This is very similar to the one above. The top banner was resized, the design along with it. This one looked better than above but the frames were removed so every page, excluding the episode archive, would have to have the menu and banner on the top of it. Also the website looked tiny on my laptop which has one of the lowest widescreen resolutions on it, so I think you can see where I'm going with this. The reason why the version has A in its title was I was working on another design at the same time, both of which ended up in the same folder. I've no idea why I did that either. This is what happens when I try to be different. I don't yet I make a big mess all the same. Like above this version was mostly frameless. The banner sat at the top, dates underneath, then the episode showing & news column. Finally the menu would sit at the bottom of this frameless page where most people would not see it unless they scrolled. The menu was vertical as well, so it left room for another box like that one on the right with update info. Needless to say, I didn't spend anymore time on this thing. Fifth Voyager came back to life in this. It was nice enough, but half way through 2013 I was already working on another one. The intro image was taken from an earlier version, I think the missing 2008 version I mentioned. This design was basically a more up to date version of 2007's, I had even re-done that same banner. I've already mentioned that I was in a hurry to pick something, and I was rusty as hell. I know a lot of my designs are a bit same-ey anyway, so that's probably why I had trouble. Nevertheless this one was more than okay to last the year. Like the previous year I thought about using lcars in the design, this was the first one that I didn't give up on right away. For a while it was going to be the one, as evidenced by the home page on the right having text in it. The right box was an inline frame so everything but the Episode Archive would go there. I dumped this design mainly because I wanted it to fit on every resolution so it wouldn't be lost on larger ones. I failed. Also the menu text was a custom font, and it still didn't look right. I tried again but as you can see, I didn't get further than the menu. I think the idea was that every link would focus in on Voyager. News would be a zoomed in shot of the Conference Room. When I say zoom, it would be as instant as an image loading. I don't do flashy things like that, haha. Anyway I started again, using the same "code name" 2013 Version 3 but that later became the current version now known as Version 2014. This is definitely up there as one of my favourite designs, and so it has lasted a fair few years. It was inspired by and a tribute to the original (not The Magazine) design, launched in 2000. It has been altered over the years to try and adjust to more modern ways of browsing. I figured that FV is a fanfiction site and as such should be readable and useable on portable devices too. Some people prefer to read on computers and some prefer on their phone, so I had to accomodate. The issue is I haven't been up to date on website design for over a decade. I don't use CSS, PHP or anything flashy that could help make a mobile version work better. All I figured I could do was make a bare bones mobile version, separate from the main one and give the option to choose. I personally would prefer to have the choice as I tend to hate mobile designs. The full website remained largely unchanged until now, what with the newer version making use of the far superior mobile menu.